Tell me something about yourself? I am Gursi, a designer, perpetually looking out for bigger meanings in life. As a kid, what did you want to be when you grew up? As a kid I always wanted to do and try different things, I realised way too early that the only thing that’s constant is change. How would you describe your style? My style is mostly monochromatic, simple, and boxy. What are you wearing? 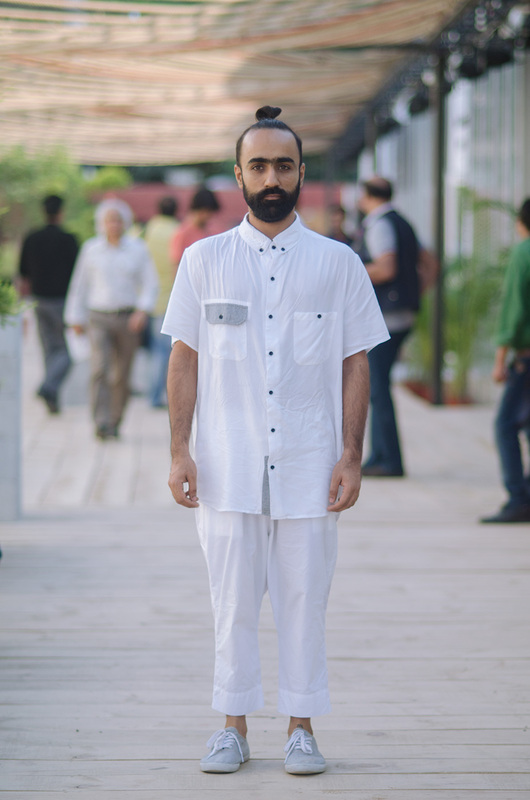 I am wearing a long oversize white shirt with grey melange paneling and a white low crotch pants – all lovebirds. Do you have any pop culture figures that you look up to? I like the androgyny and madness of Miranda July and Thom Yorke. How did you get interested in fashion? I was always interested in design. I have been doing graphics, spaces, and illustrations, and while doing all that I always had an opinion about fashion. But I got more into it after meeting Amrita while she was curating western vintage. Of course traveling and east London inspired us to do more. A phrase you can’t avoid. It’s all a game! This entry was posted on October 17, 2015 at 12:15 and is filed under India. You can follow any responses to this entry through the RSS 2.0 feed. You can leave a response, or trackback from your own site.